Why does Krang's robotic body look nothing like his original? Why did he go for Hulk Hogan and Patrick Star's love child, when he used to be a raptor thing? Wouldn't he want to look like a raptor thing again? I think the consensus is that those are some sort of mutation brought on by the process Krang used to make his clones and not what he would really look like but who knows it's kind of a continuity issue. Krang is a Kraang, he is in his correct body. That body he gets in that episode is never said to be his real one. The theory is Krang used mutagen on himself to probably give himself that Krangezoid body before it was taken away. Krang was originally an Utrom/Kraang hybrid. @Cybercubed - Kraang aren't a separate species though? Kraang are Utroms, just under mind control. Shredder also seems to be the one who made it (though later episodes would suggest that Krang could have very well made it himself), so he based it off he knew. And now, I'm going to continue my impulsive giggling at the middle fellow's mustache. Because "how" and "why". Krang has always had some weird preferences like Soap operas, so I don't think its out of the blue for him to prefer an android body of a man rather than his original raptor form. On a side note, it is interesting to note how General Traag still recognized Krang despite not having his body. Normally, you would expect that General Traag would not be able to tell who the pink blob is, but his recognition lends credit to the theory that Krang was originally his Utrom self (as shown in the flashback of the Three Musketurtles, as well as mentioned in TransDimensional Turtles) but later on acquired the reptilian body through mutation. Shredder also seems to be the one who made it (though later episodes would suggest that Krang could have very well made it himself), so he based it off he knew..
"With the body I've designed, no force on earth can stop me!" "All I ask is a body. A body which you have failed to provide for me!" Krang basically had the blueprint of the body mapped out, but needed Shredder's hands to put it together so that he would be much more able. If you got to design your own body, wouldn't you go for an upgrade? I know I for one wouldn't go with a duplicate of what I've got now. I was always under the impression Krang's brain was taken out of his original body so yeah I do wonder how General Tragg recognised him. Maybe through his voice? You mean compared to other of his species? Maybe because Traag and Granitor were inside the Technodrome when first coming to Earth in Hot Rodding Teenagers from Dimension X (and Krang looked nothing like Shredder, Bebop and Rocksteady). But isn't Traag surprised to see Krang the first time we see the former? It doesn't sound like Traag has been on the Technodrome already. 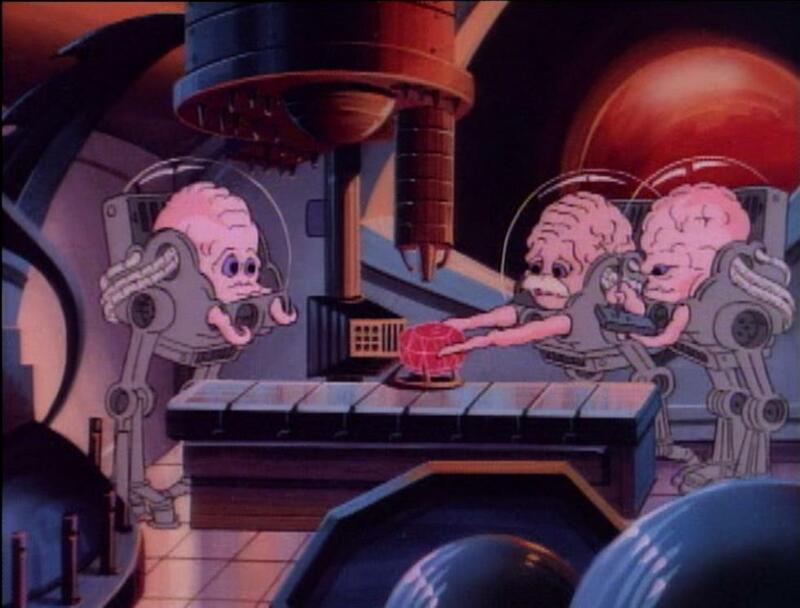 Traag and Granitor may have been in the Technodrome in Dimension X, before Krang lost his body and ended up on Earth. Krang had his new body designed before their problems with the Turtles even started. I imagine the point is he would a lot more capabilities than the other Krangazoids (ha) combined and would be able to subjugate them with little problem with that new body. He had been exiled from Dimension X and this body would ensure that no one would be able to do that again. What I mean is that Traag was surprised the first time he saw Krang in his brain form as was Krang seeing Traag. The only way he'd recognise Krang was from his voice. If both Traag and Granitor had been in the Technodrome already they wouldn't be surprised to see Krang in that Season 1 episode unless Traag had spied on Krang without Krang being aware they were onboard. Perhaps Traag recognized Krang because his head stayed the same, only difference that he lost his reptilian body. He even asks him. "My Lord, what has happened to your body?!" It is the equivalent of us stumbling upon the decapitated head of someone we know. Easy to recognize, and easily horrified.